A West Side shooting left five people hurt late Monday night, including one man in critical condition, police said. 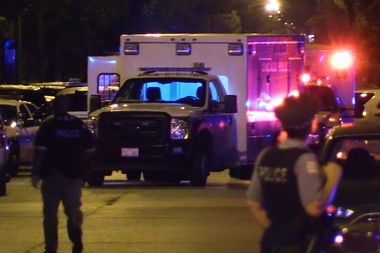 EAST GARFIELD PARK — Five men were wounded, one critically, in a shooting on the West Side late Monday night, police said. Around 11:35 p.m., the men were standing in the 3200 block of West Congress Parkway when they heard gunshots and were struck, according to Officer Ana Pacheco, a Chicago Police spokeswoman. One man, 32, was taken to Mount Sinai Hospital in critical condition after being shot multiple times, Pacheco said. Another man, 28, was brought to Mount Sinai Hospital, where he was listed in good condition with a gunshot wound in his mouth, police said. A 33-year-old man was shot in his left foot, a 32-year-old man was shot in his buttocks and a 34-year-old man was shot in his left arm, Pacheco said. All three men were taken to Stroger Hospital, where they were in good condition. No one is in custody, Pacheco said.